After a retrenchment in 2012, Chinese real estate and wood markets improved steadily in 2013 as Chinese buyers began buying again. Facing reduced log exports from Russia, China turned to more countries for its log and lumber imports. Europe’s ongoing economic woes caused wood products demand to slow further, and a recovery could take shape later in 2014. Japan showed remarkable growth due to sustained rebuilding efforts following the tsunami, and also from moves by homebuilders to get new-home starts sold prior to September 30, 2013 (the deadline for the higher consumption tax on new-home purchases to kick in). While the global economy continues to be fragile, a similar upswing in North American lumber prices in Q4/13 into Q1/14 has occurred that is mirroring a trend to the bullish prices achieved in Q4/12 and Q1/13. However, most buyers are wary of a repeat the Q2/13 lumber price crash, and should any crash re-occur, then this could stall prices from moving much higher for some time. In any event, when higher prices are achieved in North America, it will result in upward price movement on lumber and logs in Asia, and could create enhanced export opportunities for both European and Southern Hemisphere exporters. When higher prices are achieved in North America, it will result in upward price movement on lumber and logs in Asia, and could create enhanced export opportunities for both European and Southern Hemisphere exporters. After a 3.4 per cent gain in 2012, total global softwood lumber consumption in 2013 is projected to see a more modest gain of 1.8 per cent versus 2012, reaching 290 million m3 (181 billion bf, nominal). The U.S., China and Japan are expected to achieve the highest growth rates in 2013. For 2014, the global outlook is for an improved gain to 300 million m3 (+3.4 per cent). All major regions are expected to show increases in demand, with Japan perhaps being the only exception (as constructions slows somewhat after two strong years of growth). The U.S. and China are projected to see the highest growth rates in 2014, and these two regions could provide a catalyst for rising prices due to the tighter relationship of these markets in international trade. Global softwood production trends should mirror their consumption counterparts in 2013, increasing by 3.1 per cent to 298 million m3 (186 billion bf nominal. For 2014, production is forecast to grow by a similar amount to reach 307 million m3 (+3.0 per cent). A rebound in North American production (to supply the recovering U.S. housing market) will have the largest influence on global production in 2013: a gain of five per cent is forecast. And, in 2014, North American production is expected to jump even further, moving up by 5.5 per cent in the U.S. and 6.5 per cent in Canada. European production should finally get moving in 2014 (a 3.5 per cent increase is forecast) as export markets create further opportunities. Increased exports to markets in Asia, the Middle East and North Africa will absorb the extra volume. The U.S. economy remains somewhat fragile, and recent GDP growth was on the low side for 2013 (1.9 per cent) but Q4/13 grew at an annual rate of 3.7 per cent for the last six months of 2013. The outlook is higher for 2014 at 2.6 per cent. A major downside risk has emerged: the ongoing battle in Congress over budget spending limits has resulted in lower consumer confidence and higher borrowing rates for government. The familiar themes of high unemployment, home foreclosures and “underwater” mortgages have been nearly as prominent in 2013 as in 2012. U.S. housing, the key driver of North American lumber consumption, is now on a slow upward trajectory. New- and existing-home stocks have retreated to historically average levels, prices have stabilized and are rising in many regions, and starts have been growing (albeit from very low levels). Based on increased housing starts, lumber consumption for new U.S. residential construction alone should soar in the next two years. Demand will also grow due to strong gains in repair and remodelling, industrial, and commercial applications. Based on the demand forecast, total U.S. lumber consumption is projected to rise strongly, moving from almost 40 billion bf in 2013 (nominal) to 43 billion bf in 2014 and over 47 billion bf in 2015 — up by about nine per cent each year. Total Canadian demand will also expand, but at a much slower pace (given that Canada’s housing market has already recovered fully from the 2009 recession). Although limited by tightening timber harvests in the B.C. Interior, Ontario and Quebec, Canadian shipments are also forecast to grow, moving from 24.0 billion bf in 2013 to 25.0 billion bf in 2014 (+4.4 per cent), and then to 25.8 billion bf in 2015 (+3.4 per cent). North American production has recovered by four to five per cent per year in the last two years, and is expected to expand at a similar rate in the next two. Total North American output is projected to be almost 54 billion bf (nominal) in 2013, and is forecast to grow to 56.5 billion bf in 2014 (+5.3 per cent) and 59.5 billion bf in 2015 (+5.3 per cent over 2014). The lion’s share of this increase is likely to come from the U.S.: shipments are projected to grow from almost 30 billion bf in 2013 to 31.6 billion bf in 2014 (+6 per cent) and to almost 34 billion bf by 2015 (+6 per cent from 2013). Although limited by tightening timber harvests in the B.C. Interior, Ontario and Quebec, Canadian shipments are also forecast to grow, moving from 24.0 billion bf in 2013 to 25.0 billion bf in 2014 (+4.4 per cent), and then to 25.8 billion bf in 2015 (+3.4 per cent). The peak year of the timber harvest in the B.C. Interior is expected to be 2015 or perhaps 2016, and then the last round of sawmill closures should start until the end of the decade when most mills will be back to cutting green logs. Chinese softwood lumber imports continue to grow, and the peak level of 14.9 million m3 achieved in 2011 and this was surpassed in 2013 at nearly 17 million m3. The Chinese market continues to tighten the supply of lumber in North America, allowing lumber exporters from around the world to ship more lumber to China. North American lumber suppliers will need to watch the movement of market prices more closely in China. This is because Chinese buyers have become more aware of softwood resources and products available in other countries/regions worldwide. The Chinese are recognizing other lumber supply options, especially as prices move up in North America (as they did during the 2012/13 spike). The softwood lumber supply world for Chinese importers has become much larger and this will impact softwood lumber suppliers/sources in the future. The days of SPF setting the tone for lumber markets in China should begin to diminish, especially as the U.S. market gets hotter and exports to China diminish. Further details are available in WOOD MARKETS’ monthly China Bulletin and The China Book • Outlook to 2017. 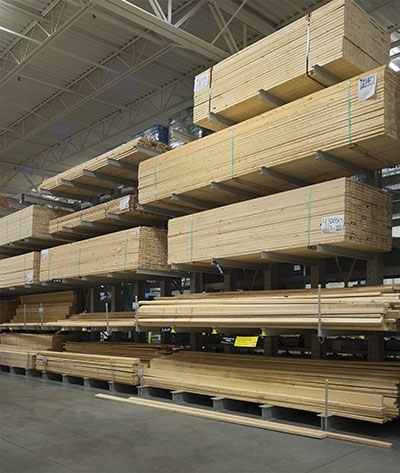 WOOD MARKETS 2014 full five-year lumber forecast to 2018 predicts two distinct price spikes. The first one is anticipated in about two to three years, but will require sustained, strong demand (including an ongoing rebound in U.S. housing starts). A runaway market can only happen when the supply chain can’t keep up with demand and must struggle to keep enough lumber products moving to customers in a timely manner. We have seen this event occur a few times now since the beginning of 2010. With supply steadily ramping up in all regions of North America at a pace of five to six per cent per year, a price spike will require U.S. demand — and especially housing starts — to expand substantially and at a faster rate than production (if tension is to be kept on supply). This could occur if housing starts move toward their long-term sustainable level of 1.5 million units through increases of at least 150,000 to 175,000 starts per year from 928,000 units in 2013. Steady to rising demand should move prices generally higher, and very high prices will attract incremental domestic production (when economically or practically available), as well as imports into the U.S. market. This event is now forecast to occur in 2015 or 2016. At some point, supply will catch up to demand and a price retreat will occur (as it always does). Extracted from WOOD MARKETS 2014 — The Five-Year North America Lumber & Panel Outlook 2014–2018 - see http://www.woodmarkets.com/p_wmbook.html. Detailed summaries appear in WOOD Markets Monthly International Report.